These Browning hunting boots feature foot-shape geometry optimized for all hunting boot applications, semi-locking lacing for a secure fit, a padded tongue for comfort over instep and shin, and a kick-off ledge for an easy off. Tacky lugs and widely spaced outsole geometry provide superior grip and max displacement of mud and snow. These Browning hunting boots feature foot-shape geometry optimized for all hunting boot applications, semi-locking lacing for a secure fit, a padded tongue for comfort over instep and shin, and a kick-off ledge for an easy off. Tacky lugs and widely spaced outsole geometry provide superior grip and max displacement of mud and snow. An integrated shank provides torsional rigidity with a rubber compound formulated for grip in wet conditions. With an antimicrobial, open-cell foam in the midsole and 400g Thinsulate Ultra®, these boots provide ultimate moisture control and advanced insulation. 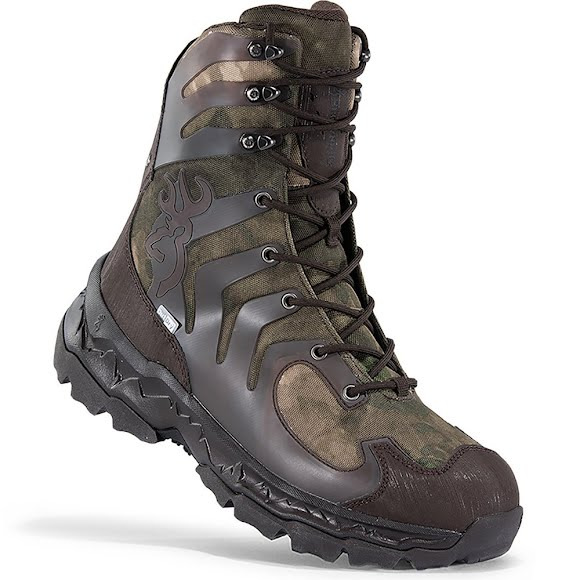 Featuring a 100% waterproof, breathable OutDry laminated membrane and 900D stain-resistant polyester with mesh lining, these hunting boots keep your feet dry and warm for the long haul. Official Browning® product guarantees unsurpassed quality and an unwavering commitment to being The Best There Is. These genuine Browning boots set the bar high with innovative design and premium outdoor style. Traditional waterproof gear utilizes seam sealed waterproof fabrics. This results in a floating inner, and allows water and debris to stagnate between layers, making the shoe or garment feel cold and heavy. On the other hand, OutDry features a patented lamination process that bonds an absolutely waterproof membrane directly to the garment&apos;s highly breathable outermost layer. Water is sealed out at every possible entry point, giving OutDry gear a superior fit that stays dry, warm and comfortable. Extreme performance footwear insulation from 3M is loftier and thicker than original Thinsulate insulationâ€”for even greater warmth and comfort. Yet still thin enough to allow complete freedom of movement.